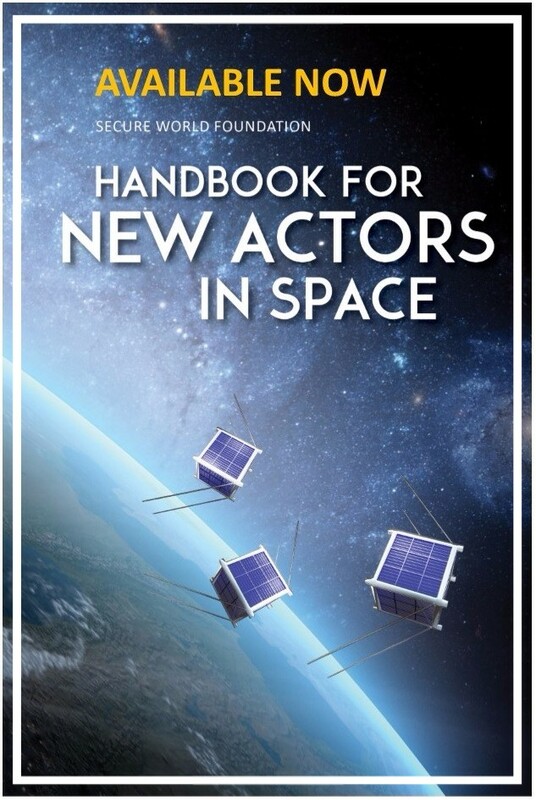 Chris Johnson will be a guest lecturer at the Geneva Centre for Security Policy's course "The Future of Outer Space Security"
SWF released the first edition of the Handbook for New Actors in Space in both print and electronic format. SWF staff will have a limited number of physical copies available at events throughout 2017. We give thanks to our team of experts and contributors. An electronic copy is available here. We look forward to your comments and feedback for future editions. SWF is pleased to announce that SWF Technical Advisor, Dr. Brian Weeden has accepted a new position as our Director of Program Planning. Dr. Weeden will continue to lead and provide his expertise to SWF projects while also guiding future year project planning and strategic program development to ensure SWF fulfills our mission. Congratulations! We would like to congratulate the recipient of the Ray Williamson Future Fund Award, Luis Ángel Castellanos Velasco. SWF is pleased to honor Mr. Castellanos Velasco by providing this scholarship to attend the International Space University Southern Hemisphere Space Studies Program 2017 (ISU SH-SSP) in Adelaide, Australia. SWF welcomes Dr. Angie Bukley to the 2018 class of the SWF Advisory Committee. Dr. Bukley brings over 30 years of professional experience providing technical and management expertise in the defense and space sectors to the team. SWF is pleased to be working with her. On January 11, 2007, China destroyed one of its aging weather satellites using a ground-based anti-satellite (ASAT) weapon. In the aftermath, there were debates by U.S. scholars and policymakers alike as to the motivation for the test, and what it meant for U.S. policy and strategy. One year later, the United States used a converted ballistic missile interceptor to destroy one of its own failed spy satellites in what was officially stated to be an act of public safety, but many saw as a public demonstration of its own capability. The two events reignited international and domestic debates over strategic stability and deterrence, space weaponization, and the potential for a space arms race. Over the last several years, we at SWF have been working to try and foster stronger relations between the U.S. and China in space, in part to prevent an incident in space that could spark or escalate conflict on Earth. Part of our efforts have been focused on increasing dialogue between Chinese space experts and international experts. In 2010, 2011, and 2012, we partnered with Beihang University to hold a series of workshops in Beijing on space debris, space debris removal, and space sustainability. The goal of the workshops was to bring U.S. and international experts to China to exchange perspectives with their Chinese counterparts, and to encourage similar research and discussions within China...continue reading. SWF brought together experts to discuss the evolution of the space security environment over the last decade, and specifically the evolution and current state of the relationship between the United States and China. Panelists provided the perceptions and tensions of each country, and suggested potential options and strategies the Trump Administration may take. SWF co-organized a luncheon symposium for the 50th Anniversary of the Outer Space Treaty with the American Society of International Law (ASIL) and held at Georgetown University. The luncheon allowed for reflection on the development of the Outer Space Treaty, the significant role the U.S. government played in its development, as well as rationales behind the treaty and fundamentals of public international law underpinning the document and informing our understanding of it. The audio recording is available here. Project Manager Krystal Wilson attended the Geospatial World Forum in Hyderabad, India. She spoke at a pre-conference event "Geospatial & Statistics: Integration for Informed Decision Making" which looked at the ways, reasons and benefits of integrating geospatial and statistical information for making better policies and decisions, achieving resource optimization, monitoring resources and developing sustainable revenue models. Ms. Wilson's presentation on maximizing the use of geospatial and statistical data for the Sustainable Development Goals can be found here. Project Manager Ian Christensen spoke at a workshop on “Space Sustainability and Small Satellites during the 12th Annual Ilan Ramon Conference in Herzliya, Israel. The workshop featured interactive group discussion of several topics related to the increasing use of small satellites, including: space situational awareness; space traffic management, regulatory and policy frameworks; and both the opportunities and challenges of large constellations. The Ilan Ramon Conference is organized on an annual basis by the Israel Space Agency and the Fisher Brothers Institute for Air and Space Strategic Studies as a memorial to Israeli astronaut Ilan Ramon, who was a crewmember on the STS-107 Columbia accident. Executive Director Michael Simpson moderated the panel on “Enabling Space-Faring Nations to Work Together as a Team” during the February 1 morning session of the Global Space Congress in Abu Dhabi. During the two day event, he also briefed participants on the work of the Hague Space Resources Governance Working Group of which he is a Vice Chair. Director of Program Planning Brian Weeden quoted by USA Today on new air force warning satellite. Space Law Advisor Chris Johnson quoted by The Verge on the significance of the Outer Space Treaty. Mr. Johnson quoted by Inside Science on Outer Space Treaty's contributions to the peaceful uses of outer space. Copyright © 2017 Secure World Foundation, All rights reserved.